As we are receiving several queries from DNB aspirants across the nation with regard to the stipends they will be paid in DNB Institutes/Hospitals, Team PrepLadder scrutinized your concern and thus, brings forth this blog to assist our ardent readers with the same. According to government policies, stipends are essential for every candidate to cover up the expenses incurred during internship or apprenticeship. 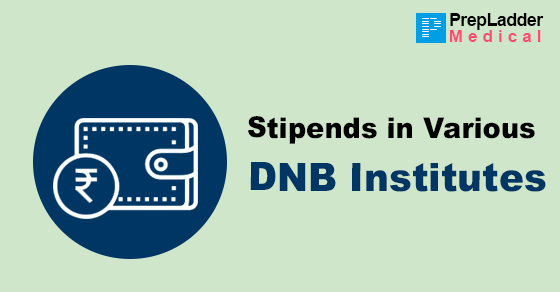 Thus, the Hospitals/Institutes are required to pay DNB candidates, a basic stipend according to the NBE stipend policy or basic stipend according to state government policy (whichever is higher). Disclaimer: The above mentioned stipend rates are according to NBE guidelines and are tentative. It may vary state-wise or from institute to institute. According to NBE guidelines, stipend may vary periodically and prefers that hospitals shall provide accommodation apart from stipend. Moreover, NBE has no objection if payment of stipend is more than stipulated which depend upon the paying capacity of the hospitals/institutes and trainees work load. We hope this blog has familiarized once for all about the stipulated stipend for various DNB programs.